Mondays are my favorite days because it’s the one day I get one-on-one time with my little munchkin. A typical Monday morning goes like this: breakfast of some egg concoction with a side of rice, then story time at the local library where we sing songs with our friends, then we devour croissants at Moonside Bakery before heading to swim class. That takes us to noon when we go back home for lunch and naps. After that, our Monday afternoon could be a trip to the zoo or shopping or just resting at home. Yesterday, we went to three farms and a bakery (sounds like a movie title). 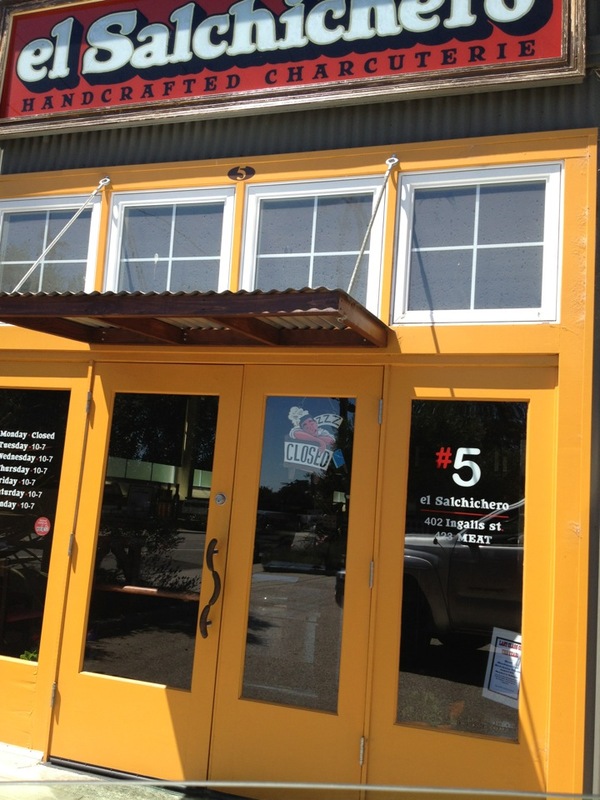 First, we dropped by Kelly’s to grab some dessert (apple crumb tartlets). Our intention was to get some meat at El Salchichero but sadly, they were closed. 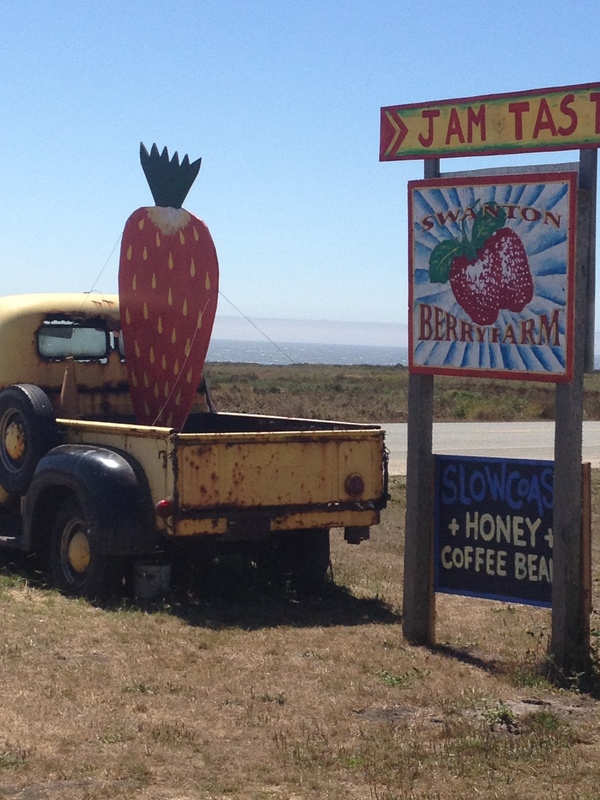 After grabbing our desserts, we traveled along HWY 1 toward home. I’ve always wanted to take Ne to pick strawberries so we stopped at Swanson Berry Farm. She had a blast and nearly finished off her basket on the 10 minute drive to Harley Farms. There, we spent some time with the goats and picked up some raviolis then went to Jacobs Farm (which usually isn’t open on Mondays) to pick up our weekly veggies. All within 35 miles from the house. We are so damn lucky! Needless to say, last night’s dinner was delicious and farm fresh! Boil the ravioli per the instructions in salted water. Melt 2 TBs butter over medium heat and add the leeks. Cook until the leeks are soft. If the butter starts to brown, add a bit of olive oil. Remove to a separate bowl. Melt the remaining butter over medium heat and keep swirling until it becomes a golden brown (~5 mins). Add the sage for one minute. Add the leeks. And remove from the heat. 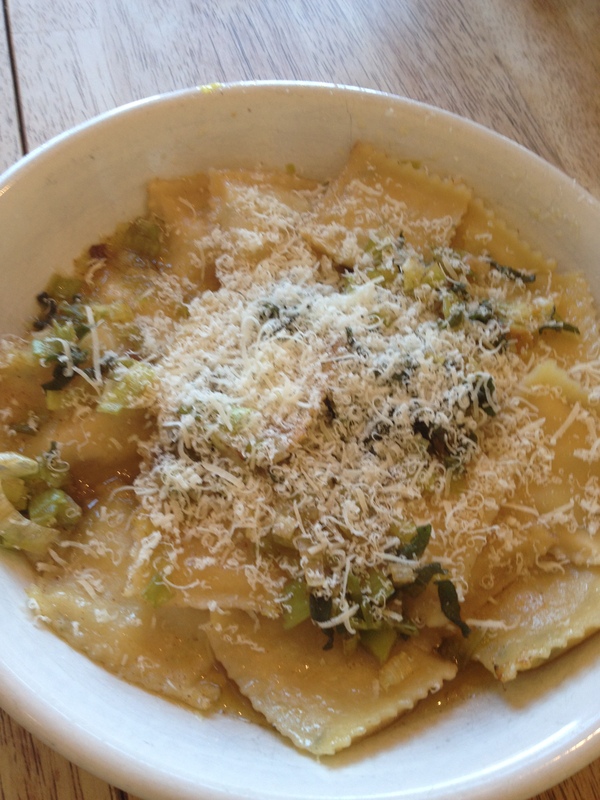 Using a slotted spoon, remove the cooked ravioli from the pasta water and gently place into the pan of butter, leeks and sage. Give it a little toss and then serve. Garnish with freshly grated Parmesan and cracked pepper. Scrumptious! These stuffed mushrooms are such a hit every time I make them (which is usually for Superbowl Parties or family get-togethers). While at the Campbell market, I came across some gorgeous button mushrooms that were the perfect size for stuffed shrooms. I couldn’t resist buying a couple to make for our little family dinner (of 2 and a half). Sauté the shallots over medium heat in a bit of olive oil until softened (about 3 minutes). Add garlic and cook for another minute. 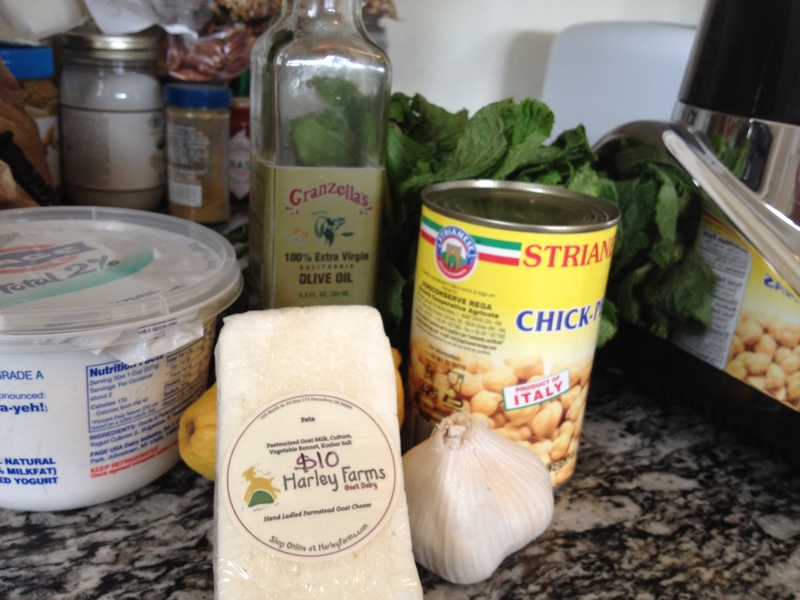 In a medium bowl, mix the cream cheese and goat cheese until combined. Add the chopped proscuitto, shallots and garlic, chives, a bit of pepper. Stir to combine. In another bowl, combine the panko, parmesean and the extra chives with a bit of freshly cracked pepper. Using a table spoon, generously fill each mushroom cap. 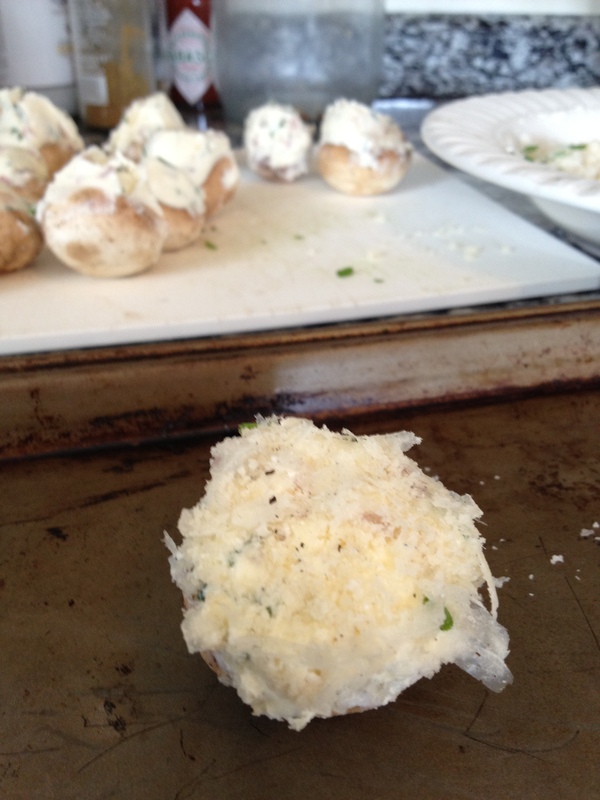 Dip the top of each mushroom in the panko mixture, and then put on the baking sheet. Lightly drizzle the mushroom tops with olive oil. 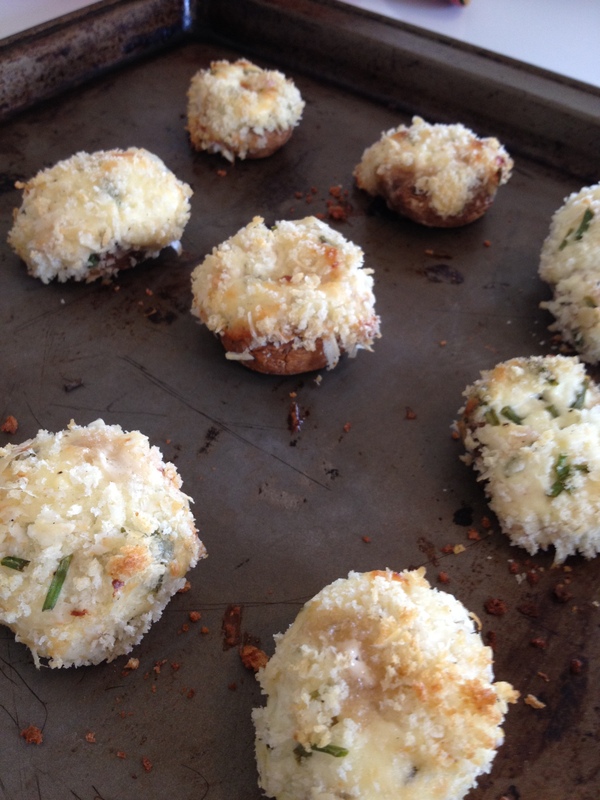 Bake the mushrooms in a 400˚ oven for 12-18 minutes, or until the tops are golden brown. Serve warm. This batch didn’t even make it to the platter. We ate them straight from the cookie sheet. I’m lucky enough to be gardening again in San Jose. Or rather, planting and harvesting in SJ. My sister has graciously let me plant some of my favorites in her veggie garden: tomatoes, squashes, peppers and eggplants. She’s since kept up the watering and tending. And now the veggies are going bonkers. Each visit, I go out to her garden and am wowed by both the massive quantity of veggies on each plant and the enormous size of her veggies. Seriously, the zucchinis look like wiffle ball bats. The last visit she gave me her first eggplants. They are so beautiful with their shiny, deep purple skins. I couldn’t wait to get them into the oven (I love the smell of roasted veggies!) and then I added this with them. Blend yogurt, chickpeas, 2 TB olive oil, garlic, and half lemon juice until slightly blended (looks gritty). 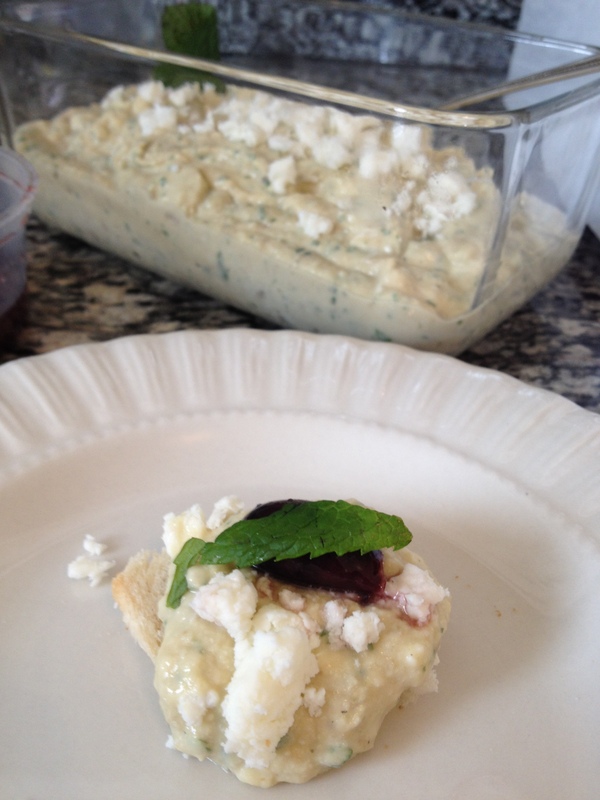 Add feta, eggplant and give it a quick whirl (should be chunky). Stir in mint and S&P to taste. Add more lemon juice if needed. Scrumptious with any bread and additional feta and kalamata olives. Can be served hot or cold (best warm).